Be the first to share your favorite memory, photo or story of Beverly . This memorial page is dedicated for family, friends and future generations to celebrate the life of their loved one. Beverly J. King, age 90, of Merrill, WI, passed away Saturday, March 30, 2019. Beverly was born June 8, 1928, in Merrill, WI, the daughter of Herman and Irene (Rouleau) Leavitt. Bev was educated and graduated from Merrill High School in 1946. On June 14, 1947, she married Alfred D. King in Merrill. He preceded her in death on October 28, 1998. Over their 51 years of marriage, she and Al resided in Bradenton, FL, Marshfield, WI, Ripon, WI, and returned to Merrill in 1987, where they lived out their lives in the King family home. 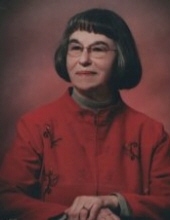 During their Ripon years she worked at the National Forensic League, Ripon College, and Ripon Public Library. She was actively involved with Our Saviors UCC, Ripon Historical Society, and was an Honorary Member of the Ripon Educational Club. While living in Merrill she was a member of St. Stephens UCC, and was a board member of the Merrill Historical Society, where her work included family, business, and home research, and public exhibits. She was also a member of the Wisconsin Historical Society, National Society Daughters of the American Revolution, and the National Association of Leavitt Families. She was a loving mother and grandmother that enjoyed family get-togethers and researching the King, Leavitt, and Rouleau families. She was also an avid Wisconsin Badgers sports fan. Survivors include children Jonathon (Janine), Greenfield; Kathryn (Kenneth) Landolt, Merrill; and Andrew (Kandie), Tomahawk; grandchildren, Matthew (Abigail) Landolt; Michaela King; and four step-grandchildren. She is further survived by brother Donald Leavitt, Bradenton, FL and many nieces and nephews. She was preceded in death by her parents, her husband, her brother, Stanley Leavitt; and her sister, Marion Kidd. Per Beverly’s wishes, there will be a graveside service at 11:00 am on Saturday, June 8, 2019, at Merrill Memorial Park with a Celebration of Life to follow at St. Stephens UCC, Merrill. Memorials may be directed to St. Stephens UCC or the Merrill Historical Society. To send flowers or a remembrance gift to the family of Beverly J. King, please visit our Tribute Store. Guaranteed delivery before Beverly 's graveside begins. Guaranteed delivery before Beverly 's celebration of life begins. "Email Address" would like to share the life celebration of Beverly J. King. Click on the "link" to go to share a favorite memory or leave a condolence message for the family.